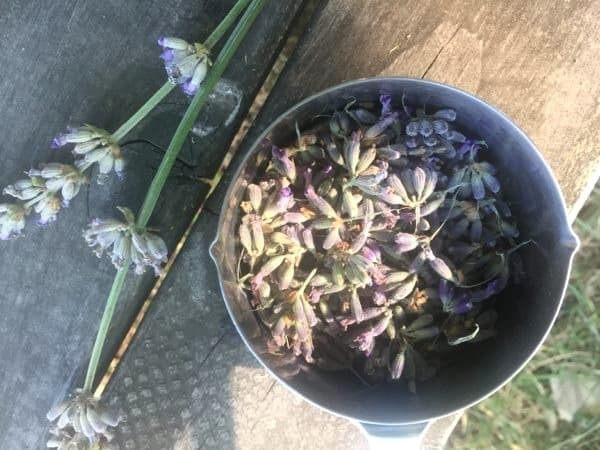 July 13, 2018 7 comments on "Lavender Lemonade Recipe"
I know using lavender in recipes has been popular for quite awhile, but I guess I missed the boat. Lavender grows well where we live in southeastern Washington state, and we have a couple of beautiful lavender farms we can go visit to harvest fresh lavender. 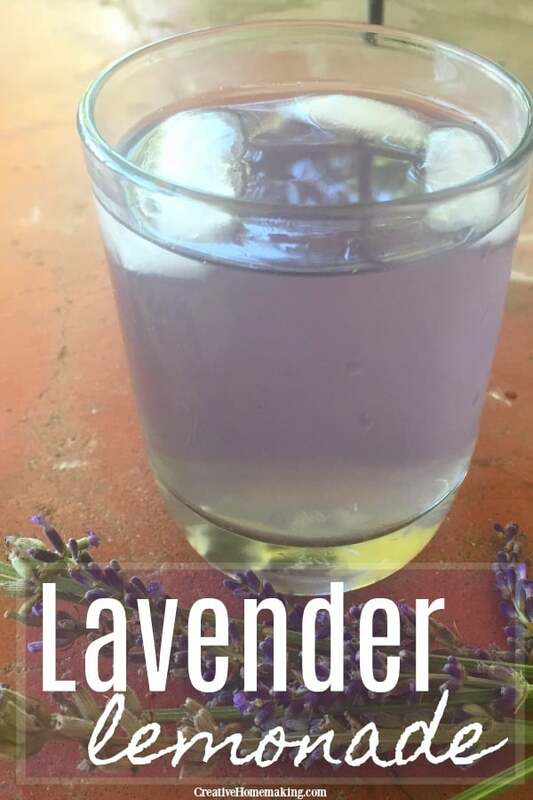 I decided to try this easy lavender lemonade recipe to see what all the fuss was about. If you’ve never tried lavender lemonade before, it’s really different! My 13-year-old son told me he really liked it but he couldn’t smell it while he was drinking it because it smelled too much like flowers. That cracked me up. I love the smell of lavender. Lavender actually has lots of medicinal qualities. Herbalists claim that lavender helps ease headaches, tension, and calm anxiety. Well, I sure hope that is all true. If it is I will definitely be drinking it every day! You can make this recipe with either dried lavender flowers or fresh lavender flowers. The measurements are just a little different. I have never learned much about lavender, so I was surprised to find out that there are so many varieties. The woman at the lavender farm told me that all kinds of lavender are edible, but that some is more suitable for cooking and eating than others. English lavender is what you are looking for to use for cooking, especially if you are harvesting the lavender yourself and you have a choice as to which kind you want to buy. French lavender has camphor in it, which gives it a much stronger taste that some people don’t like. It’s still fine to use, but the flavor will be slightly different. Also make sure that the lavender you use has not been treated with any pesticides or any other kinds of chemicals that would make it unsafe to eat. If you don’t have easy access to fresh lavender, you can order dried lavender online from Amazon. Most of the lavender available from Amazon says that it is from France, but it does say that it is culinary grade, so that is what you are looking for. In a small sauce pan, combine 2 cups of the water with the sugar and lavender. Bring to a boil and stir until sugar is completely dissolved. Remove from heat. Let mixture sit for about 10 minutes. Strain the mixture through a fine mesh sieve to remove lavender flowers. In a large pitcher combine lavender mixture with lemon juice and 4 cups water. Stir. Serve with ice. This recipe serves about 8 people. 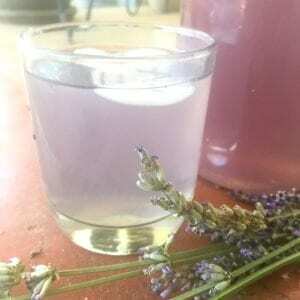 Note: The color of your lavender lemonade will vary widely depending on the variety of lavender you use. Your lemonade may not have a purple tint to it at all if the flowers are really light colored, and that’s totally fine it will still taste great! If you want your lavender lemonade to be the same shade as in the photos, I added two small drops of red food coloring and two drops of blue food coloring to the pitcher before serving. This step is totally optional. Like this recipe? Try my recipes for lavender iced tea or rose petal iced tea. 7 Comments on "Lavender Lemonade Recipe"
You did not state how much sugar. Was it the 1-1/4 cups that was second listing for water that should be the amount of sugar? Sounds yummy! I love lavender. Made lavender jelly for the first time last fall….it is really good. Hi! Yes, that should have been 1 1/4 cups sugar. I’ve updated the recipe. Thanks for catching that! Recipe lists water twice. Is second ingredient supposed to be sugar? Thanks so much! I will try this today! I used to make lavender cookies. The two together would be a lovely treat and look adorable.